We used to take Tetris everywhere with us on our Gameboys, but this is the 21st century and we’re all about constant, unfettered access to fun. 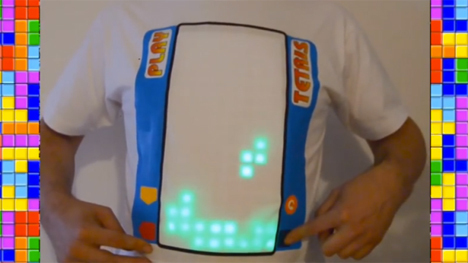 Never mind all of the other portable consoles, smartphone games and everything else we use to amuse ourselves – Marc Kerger has invented a wearable game of Tetris. 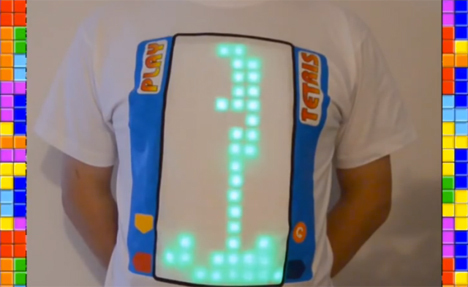 The Tetris T-shirt features a screen with 128 LEDs; behind the scenes are two Adafruit Matrix controllers and four 3D printed soft button controllers. An Arduino controller and the battery compartment are housed in 3D printed covers to keep them protected from your sweat. The battery compartment is removable and presumably (hopefully) the T-shirt is washable. Although the shirt doesn’t play the iconic Tetris music, the gameplay is surprisingly fun and easy looking…but you’ll have to learn to play upside down. Offering to let someone else play the game on your shirt might just be a great way to make a new friend, though. Kerger’s shirt is a one-off personal creation that he doesn’t plan on selling because of its high cost, but you can get the programming instructions from his own info source: the Pumpktris on Instructables. See more in Gaming & Geek or under Gadgets. July, 2014.